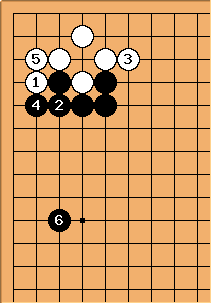 Alex: This move is not joseki, but seen quite often in amateur play, especially at the 10-20 kyu level. It seems intuitive to beginners that it attacks while building influence on the left, but it is not so good. I have no time now, but I'll come back and write a bit about what's wrong with it soon. In the meantime, others should feel free to start up a discussion. 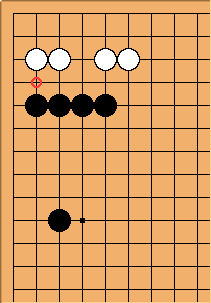 unkx80: See Tricks In Joseki for some discussion on this. Bill: Hmmm. How about ? and seem forced. Through isn't this fairly even? BramGo I wonder what has to offer that a plain doesn't have? In my opinion has little or no constructive advantage for black, but does help white. Bill: But then after Black has nothing better than . 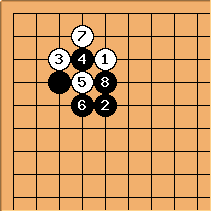 (If Black takes the ko, White plays .) Through maybe White has a slight advantage. nachtrabe: If were already in place before playing the knight's move, and this sequence were followed given B sente at the end instead of having to play , would it be roughly even in your estimation? 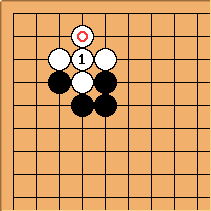 Bill: Doing a rough tewari, and keeping in mind that White has a stone at , which adds a couple of points in favor of White, and considering that Black has an extra stone, this looks pretty equitable to me. Bill: On second thought, simply filling with looks fine. 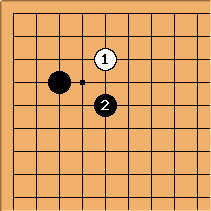 The stone, while inefficient, is a definite plus value, not to mention Black's captured stone. Quite sure. 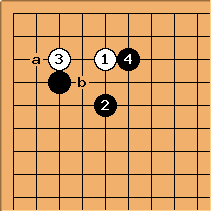 This line is discussed in Tricks in Joseki.